I received my BA and MA degrees from National Taiwan University and my Ph.D. in Sociology from the State University of New York - Binghamton. My master thesis compares the politics of labor unions in polyester and textile industries in the first decade of post-martial law Taiwan (1987-1996). My doctoral thesis examines the role of Chinese overseas in the hegemonic transition in maritime Asia from British free-trade imperialism to the Japanese East Asian New Order in the interwar years (1919-1941). Prior to joining the Hopkins faculty, I was an assistant professor of Asian history (tenure track) and director of East Asian Studies minor at the Rose-Hulman Institute of Technology between September 2007 and June 2011. While serving at Rose-Hulman, I was selected as the Institute’s faculty member of the week, and received the department’s outstanding scholar award. I research on Chinese diaspora, business networks, colonial empires, nationalism, transnationalism, and maritime East Asia in world-historical and comparative perspectives. 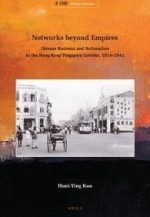 I am the author of Networks beyond Empires: Chinese Business and Nationalist Activities in the Hong Kong-Singapore Corridor, 1914–1941 (Leiden and Boston: Brill, August 2014). In the book, I argue that Chinese overseas businesses and nationalist campaigns overlapped with the boundary of speech-group networks. In colonial Hong Kong and Singapore, through negotiating with the British and Japanese imperialist powers as well as Chinese state-builders, Chinese overseas bourgeoisie contributed to the making of an automatic space of diasporic nationalism. The book project was awarded a Social Science Research Council Postdoctoral Fellowship for Transregional Research, which supported its completion in the 2012-13 academic year. My research articles on Chinese nationalism and trade in colonial Asia have appeared in the following edited volumes: Singapore in Global History (Amsterdam University Press 2011), Chinese History in Geographical Perspectives (Lexington Press 2013) and Race and Racism in Modern East Asia: Interactions, Nationalism and Gender (Brill, forthcoming 2015). My works also appeared in refereed journals including Journal of Contemporary Asia, Enterprise and Society: International Journal of Business History, Review: A Journal of the Fernand Braudel Center, and China Information, among others. Between May and August 2014, I was appointed as a visiting senior researcher at Asia Research Institute at National University of Singapore. I am now working on two new projects. The first one examines the operation of Confucian revival movements in colonial Asia. The second one compares Chinese and Japanese historiography of maritime silk road in the early twentieth century. ＜介於閩南人與日本籍民之間：日本南進與南洋閩僑眼中的台灣人，1912-1941＞ (Taiwanese in Japan’s Southward Advance and South Seas Chinese Nationalism, 1912-1941)，《海外華人研究學報》Journal of Overseas Chinese Studies, Vol. 8 (2013): forthcoming. “Native-Place Ties in Transnational Networks: Overseas Chinese Nationalist Campaigns and Fujian’s Development, 1928-1941,” in Yongtao Du and Jeff Kyong-McClain eds., Chinese History in Geographical Perspective, 1500-Present, (Lexington, MA: Lexington Press, 2013), Ch. 8. “Social Discourse and Economic Functions: The Singapore Chinese in Japan’s Southward Expansion, 1914-1941,” in Derek Heng and Syed Muhd Khairudin Aljunied eds. Singapore in Global History (Amsterdam: Amsterdam University Press, 2011), Ch. 6. “'One Country, Two Systems' and Its Antagonists in Tibet and Taiwan.” China Information, Vol. 24 (2010), no. 3: 317-337 (co-authored with Ho-fung Hung). “Agency amid Incorporation: Chinese Business Networks in Hong Kong and Singapore and the Colonial Origins of the Resurgence of East Asia, 1800–1940.” Review: Fernand Braudel Center, Vol. 32-3 (2009): 221-237. “Chinese Bourgeois Nationalism in Hong Kong and Singapore in the 1930s.” Journal of Contemporary Asia, Vol. 36, No. 3 (August 2006), pp. 385-405. “Rescuing Businesses through Transnationalism: Embedded Chinese Enterprise and Nationalist Activities in Singapore in the 1930s Great Depression.” Enterprise and Society: International Journal of Business History. Vol. 7, No. 1, Special Issue on Embedded Enterprise (March 2006), pp. 98-127.